Jane spends a great deal of time collecting flowers which are then beautifully arranged and pressed. At this stage only about 40% of these pressings are successful. These are then photographed on a very high resolution camera ( 80 megapixel, I believe ) from which sensational prints are made. 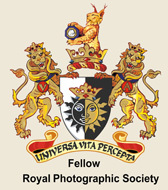 The Royal Photographic Society is a membership organisation that promotes all aspects of photography.